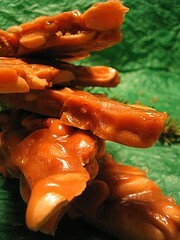 My mom's peanut brittle is the best in the west! I picked up on it after her passing so I am glad to carry this on to your readers! It's really a great recipe! Add 1 bag of raw peanuts and continue stirring while boiling 5 to 6 minutes until the syrup stuff starts looking tan-ish! Add 1 teaspoon of vanilla and 1 teaspoon of baking soda and stir real fast! Pour onto a greased cookie sheet and let cool! I suspect that "white syrup" is probably referring to corn syrup or what we call in Australia as "glucose syrup." I don't know for certain, but that's my best guess. Thanks so much for this delicious addition of Peanut Brittle. Of course, you can imagine that I will probably lay some chopped chocolate on the top before it cools. It would then melt nicely to spread across as a topping. Mmmmm. I love these old tried and true favorites. Thanks again!